If you have not done so already, fill out a 2018/19 FAFSA by June 30, 2019 in order to determine your financial need for the Summer Semester. Visit https://fafsa.gov/ to start the free application. Register for Summer courses. 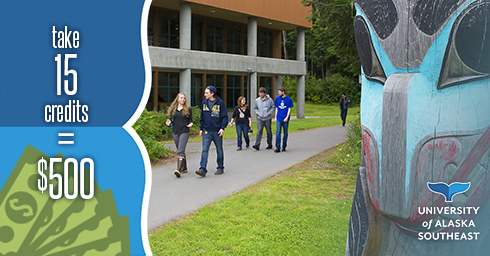 You can view the summer schedule and register for courses at http://www.uas.alaska.edu/schedule/summer.html. Once registered and your FAFSA is complete, contact the UAS Financial Aid Office to confirm your eligibility for Summer Aid. Disbursement of Financial Aid for Summer 2019 starts on May 13th, 2019. Taking 15 credits this Spring will earn you $500! Apply today. Check your financial aid required documents on UAOnline to confirm which Verification Worksheet is needed and then locate the correct form on our Forms page. The Department of Education is requiring students to submit a TAX RETURN TRANSCRIPT or LINK YOUR TAXES if selected for verification. You can choose to link your taxes to your FAFSA by using the IRS Data Retrieval Tool in place of submitting a tax transcript. For detailed instructions please view our IRS Tax Return Transcript Request Instructions. The Financial Aid Office will adjust student's budgets and Financial Aid Awards to matching their enrollment. Students not enrolled in full time status will see their Financial Aid Awards change, with a possible reduction in funds recieved. To maintain your current Award you must be enrolled full time (12 credits for Undergraduates, 9 credits for Graduates). Please monitor your Financial Aid Award on UAOnline. Please make sure you Review the Terms and Conditions of Your Awards on UAOnline for the awards that you have received. Use our Financial Aid Update Form to notify us about any additional resources, enrollment and/or status changes. Make sure to accept more financial aid than what your bill costs, have completed the Refund Instruction Form, and visit the UAS Bookstore website to complete the MBS Book Voucher form.